China appears to have installed weapons, including anti-aircraft and anti-missile systems, on all seven of the artificial islands it has built in the South China Sea, a U.S. think tank reported on Wednesday, citing new satellite imagery. AMTI said it had been tracking construction of hexagonal structures on Fiery Cross, Mischief and Subi reefs in the Spratly Islands since June and July. China has already built military length airstrips on these islands. Satellite images of Hughes and Gaven reefs showed what appeared to be anti-aircraft guns and what were likely to be close-in weapons systems (CIWS) to protect against cruise missile strikes, it said. Images from Fiery Cross Reef showed towers that likely contained targeting radar, it said. AMTI said covers had been installed on the towers at Fiery Cross, but the size of platforms on these and the covers suggested they concealed defense systems similar to those at the smaller reefs. “These gun and probable CIWS emplacements show that Beijing is serious about defense of its artificial islands in case of an armed contingency in the South China Sea,” it said. AMTI director Greg Poling said AMTI had spent months trying to figure out what the purposes of the structures was. “This is the first time that we’re confident in saying they are anti-aircraft and CIWS emplacements. We did not know that they had systems this big and this advanced there,” he told Reuters. “This is militarization. The Chinese can argue that it’s only for defensive purposes, but if you are building giant anti-aircraft gun and CIWS emplacements, it means that you are prepping for a future conflict. “They keep saying they are not militarizing, but they could deploy fighter jets and surface-to-air missiles tomorrow if they wanted to,” he said. “Now they have all the infrastructure in place for these interlocking rings of defense and power projection.”The report said the installations would likely back up a defensive umbrella provided by a future deployment of mobile surface-to-air missile (SAM) platforms like the HQ-9 system deployed to Woody Island in the Paracel Islands, farther to the north in the South China Sea. It forecast that such a deployment could happen “at any time,” noting a recent Fox News report that components for SAM systems have been spotted at the southeastern Chinese port of Jieyang, possibly destined for the South China Sea. China has said military construction on the islands will be limited to necessary defensive requirements. 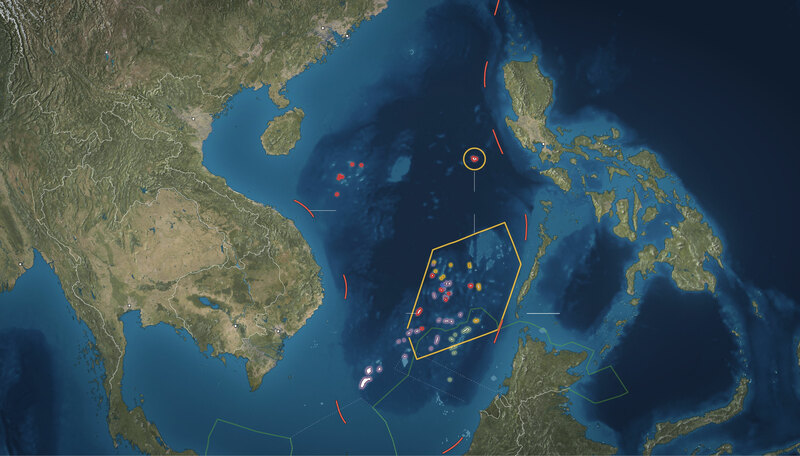 The United States has criticized what it called China’s militarization of its maritime outposts and stressed the need for freedom of navigation by conducting periodic air and naval patrols near them that have angered Beijing.